Civilizations and Other Strange Mysteries. the beginning of the weirdness. attracting all kinds of psychics, healers, and people with “alternative” professions. This was true even back in the 1930s and 1940s. investigations into California mysteries, in particular into the Mount Shasta area. psychic, occult and mystic state. California [is] the strangest state in the nation. Masters or Space Brothers, there was plenty of beautiful open land for doing so. extraterrestrial spacecraft, California is definitely the place to be. or several other lakes? Or maybe a creepy visit to a haunted hotel, museum or graveyard? directions are given on how to get there. Beyond that, it is up to you! spots I would eventually explore. even had my very own Bigfoot encounter! absolutely true and just waiting to be explored. hills or spook hills, these locations can be found across the planet. the brake, you will find that your car rolls up the apparent hill. effects are actually caused by impressive and convincing optical illusions. known only to the locals. 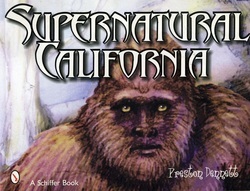 I was shocked to find that California was literally riddled with these strange sites. researchers have visited the area and conducted their own investigations. near the top of the road, you will find yourself looking down on top of the car. and a friend. Says Samson, “It was an incredible feeling as the car traveled uphill. Another gravity hill that is well-known to locals is the La Jolla Gravity Hill. gravity hills and was curious to see if this one was valid. To his delight, it was. Hill was always a source of amazement for those who were new to the experience. This particular gravity hill has been known to locals for nearly eighty years. LOCATION: West Muirlands Drive between Nautilus and Fay Street in La Jolla. gravitational pull. Don’t get me wrong, it’s definitely cool and an amazing feeling. LOCATION: End of Empire Mine Road in Antioch, outside of Stockton. site, and that it was next to a cemetery. few times we drove right over it. problem was, nobody seemed to know where the Altadena location was. just about given up on ever finding it. Now I knew exactly where it was. long. It started just south of a large stone bridge near a small white house. way this was going to work. I popped the car into neutral and slowly removed my foot from the brake. Almost immediately the car gave a small lurch backwards and started to roll uphill! and did it again. Just like before, the car rolled easily backwards. to level out and travel upwards for a short distance, then continue downwards. cars began to inch backwards, with the drivers looking at me to see my reaction. Then I realized, they obviously knew about the hill! However the main question remains, what is the cause of this bizarre effect? Cars can’t really roll uphill, can they? kind of effects we see on gravity hills. freshwater lakes? As we shall see, the evidence for their reality is compelling. abandoned the settlement, saying it was haunted. his own cattle ranch. Almost immediately, however, he began to lose livestock. He was soon to become the first eyewitness to the monster of Lake Elizabeth. his livestock were disappearing. He sold his ranch at a loss. reported seeing the gigantic reptilian. monster its own name, Elsie. surface from time to time, belching steam and fire. sightings, which reportedly stretch back to 1884.
vessels could carry them, and never came back. eggs and reproduced or even hibernated in the mud. where it can be viewed by visitors. freshwater lake located in central California along the Nevada-California border. length of twenty-two miles, an unknown creature has plenty of space to hide. that lived in the lake. many times in recent years. their sighting of a “sea-serpent” in the lake off of Tahoe Vista. witnesses from different locations on the lake. depths of the lake, leaving St. Denis and his friend amazed. Ribbon Fishing and Tahoe Trophy Trout, and spends much of his time on the lake. His next experience was even more dramatic. reach a length of eight feet. Blue Lakes east of Ukiah and Clearlake. And California is by no means unique. Wisconsin reportedly has no less than nine lake monsters. the hidden depths of our lakes and oceans.